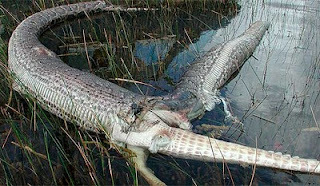 Extreme cold, not, muscular alligators, is the best defense against the python because they die of acute hypothermia, and South Florida has seen its share of near freezing temperatures over the last two years. Government officials have also been putting the squeeze on the python. Florida outlawed their ownership by individuals last year, and Senator Bill Nelson and the U.S. Fish and Wildlife service have moved to stop their trade and importation into the U.S.
Are pythons the greatest threat to the Everglades? No. 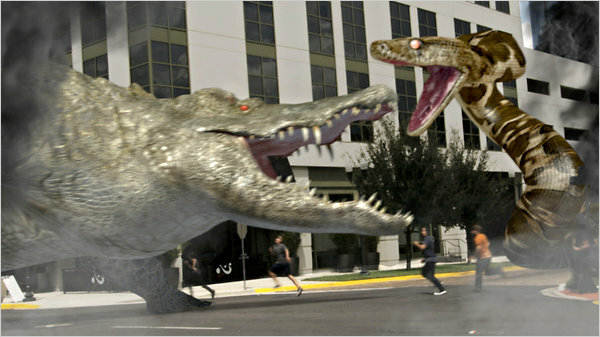 The greatest threat to the Everglades is man. We built a road called Tamiami Trail in 1928 across the Everglades cutting off fresh water flow from north to south. We allow sugar farmers and cattle ranchers to pollute the Everglades and Lake Okeechobee with phosphorus. We allowed the US Army Corps of Engineers to subdivide half of the Everglades for developers, just a year after we set aside the other half for nature. And yes, we were the ones who brought in the Pythons, not to mention Lion Fish, Brazilian Pepper, Australian Pine and Melaleuca. Will humanity’s last act be to allow climate change to engulf the entire Everglades with sea water or will it chart a new course? Maybe we’ll be smart enough to elevate 5.5 more miles of Tamiami Trail (a decision to do exactly that is now expected in days), and tear down levees that block water flow to Florida Bay. Maybe we’ll be wise enough to buy more sugar land and clean up the water before it turns the Everglades into a giant cattail farm. Hopefully, we’ll curb enough carbon emissions so that sea level rise doesn’t surpass three feet by 2100 and Everglades Restoration will work. 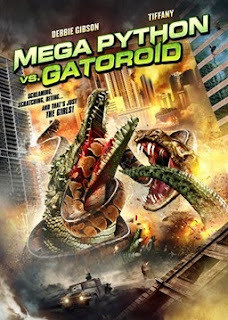 Campy or colossal, The SyFy Channel’s “Mega Python vs. Gatoroid,” is bound to make money and be a lot of fun. 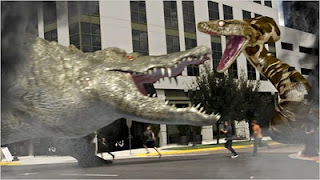 We all need to face our supersized reptilian fears sometime. But while we’re watching those bulked up gators and pythons wrestle, we must never forget man has the capacity to be the most cold-blooded predator of all.